We have had screech owl boxes in our years for 10 years now. 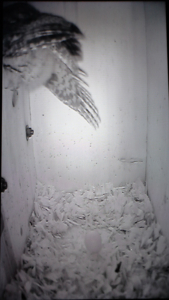 We have had a number of owlets grow up in our boxes but had no luck the last few years. Finally this year in spring of 2017 we had our first egg in 3 years. On April 4th at 11:30 we saw the first egg in the box. 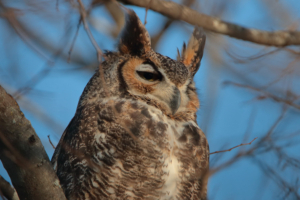 When the female was seen the next morning she was settled down on the egg and stayed there all day.